Captain Marvel is rocketing up the multiplex box-office at the moment, but, for my money, there’s a major marvel playing at Riverside Theatres at the moment that beats the kapow! out of that CGI blockbuster. Like Captain Marvel, GROUNDED features a female Air Force top gun, a fighter pilot, highly trained, with an abiding love for the big blue, the limitless sky, the ecstatic freedom of flight. She’s smart and sassy and has attained the rank of Major, a veteran of the Desert Wars. Then, drinking with her mostly male aviator cohort in a bar, she is approached and wooed by a fella that fells her with one sweet swoon and a wild weekend in the sack. Bliss blooms in her womb. She wants the child and so does the man. The only drawback to the pregnancy is that she will be grounded. She finds being wife and mother wonderful, but yearns to take to the skies again, resume her career. Husband is supportive, so much so that when she is stationed in Las Vegas, he relocates, finds a job, sets up the domestic majestic. Her home life is grounded, in the best sense of the word – secure, loving, supportive – but her career is grounded in the worst sense of the word – curbed, static, stalled. Instead of taking to the air she is given a chair, an assignment to pilot drones. Out of the blue, and into the grey. Literally and metaphorically. From Air Force to Chair Force, she sits in one desert while waging remote control war in another. This assignment changes the whole dynamic of her vocation, taking her from confident and committed combatant, an actor in kill or be killed confrontation, to desk chair assassin anonymity, morally and physically disarming her. George Brant’s script is grounded in complexity, compassion, empathy and exhilaration. 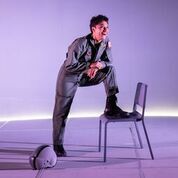 If the play was a plane it would be admired for its grace and agility and in the National Theatre of Parramatta’s production it is piloted by an ace actor. Emily Havea gives a soaring performance, aerodynamically adroit in physical and vocal presence, knowing when to steep and bank, go full throttle, and glide. Quite simply, she flies. 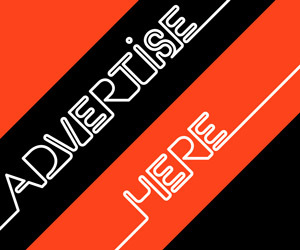 Alexander Berlage, lighting design, and sound designer Mary Rapp. 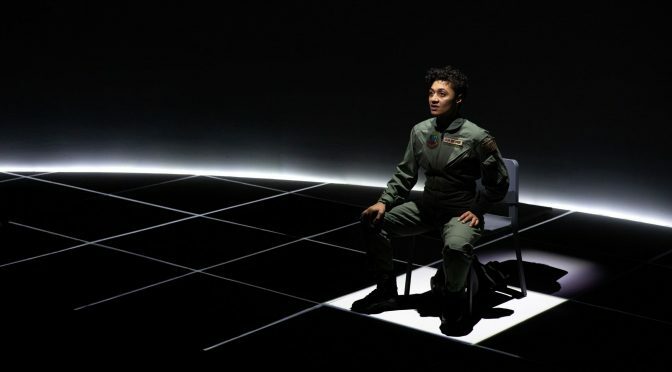 GROUNDED delivers thrilling theatre, from take off to landing. A major marvel. Come fly!